This listing is for upgrading paper stock options or design add-ons, for existing Party Print Express orders. You must have an order to add this to, or add it to the cart with your other item. This listing is not for invitations, it is for an upgrade in the stock used for an existing invitation order. 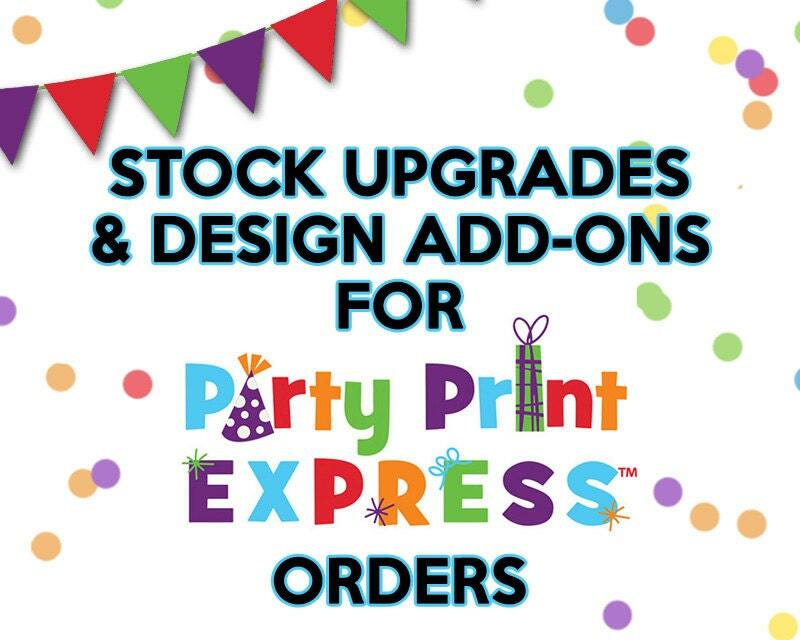 (This is also for Party Print Express' Thank You Cards & RSVP Cards) Price is for ANY quantity of product ordered, flat fee per item ordered. I.E. if you order 200 invitations or 12 invitations, an upgrade price is the same. If you order this listing without an existing order, I will send a swatch of the paper stock you chose, via USPS and that will conclude the order. Some stocks take additional time to get in stock and will extend your processing time on your order, let me know ahead of time if you're on a time constraint. Design Add Ons are for pre-determined conversations for design changes, upgrades, etc. Do not purchase a design add on if we haven't discussed it, the item may not need a design add on fee, or it may be more than displayed. If you have any questions on stock options, please ask me! I can accommodate custom stocks not listed here, just contact me for a quote if you have something specific in mind. PLEASE NOTE - some stocks have to be ordered and will delay your job a couple of days. If this is a concern to you, contact me first to make sure it is in stock. I respond quickly! -100lb Glossy White Cover - Standard stock used in my shop's card products, bright white, gloss coated on both sides, 100lb thickness. Produces bright quality print. -110lb Glossy Cover - (White) Slightly thicker than the standard stock, glossy on both sides. Produces bright quality print. -100lb Classic Linen - (solar white) Sturdy card stock, uncoated, no gloss, and embossed texture, feels like cloth when you run your fingers over it. Great for wedding invitations. -100lb Uncoated Cover - (white) Thicker/heavier than the standard stock, uncoated on both sides, so the finish is 'rough and textured'. If the design has a large coverage of ink, it will leave a sheen. Design is printed duller. Good for antique, vintage, chalk, rustic look. -12pt C1S - (White) Thickest/heaviest stock option available, gloss coated on one side, uncoated on the 2nd side. Design can be printed on the gloss (brighter) OR uncoated side (duller). On the uncoated side if the design has a large coverage of ink, it will leave a sheen. -110lb Classic Crest - (white) Thick card stock for invitations, good for simple designs and wedding invitations, matte look, no gloss coating. -10pt Cast Coat Cover - (white) High-gloss, looks 'wet', makes colorful designs really pop. Standard invitation thickness. If you have any questions on stock options, please ask me! I can accommodate custom stocks not listed here, they will need to be quoted.